So you have triumphed over the long treacherous journey to finding the love of you life. Now it is time to rejoice in that love with the ultimate victory celebration; your wedding. This is your day, you get exactly what you want. Castle or colonial? Luxury or adventure? Fairy tale or futuristic? 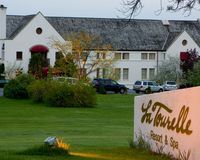 Bejeweled spa treatments, Lilac Festivals, Clothesline Celebrations, and Jazz jam sessions are just a few of the unique and varied experiences offered in the Finger Lakes resorts. Whatever it is you are looking for you will find it here on our list of Top 10 Finger Lakes Wedding Venues! When you think of luxury, you think of Belhurst. Settled amid the rolling hills and sparkling Finger Lakes of upstate New York, this all-in-one treasure holds everything you could possibly imagine needing in the ultimate romantic getaway. From fine wines to spa innovations to exquisite dining services, this legitimate castle will fulfill every possible luxury fantasy you have ever had. Want to sleep in a castle? What about a Georgian manor or a hearty inn? Belhurst encompasses all three. After the hard work of planning and executing that perfect wedding, Belhurst is the getaway tailored specifically to you. With full range services like the shopping packages, fine wine tutorials and experiences, and the innovative Isabelle Spa with their new Sapphire Abrasion skin therapy technique (a new painless exfoliating process that uses actual Sapphire granules); you can make your honeymoon dreams come true. Or why wait to be pampered until after the wedding? Bring the whole family to the castle and Belhurst will plan the ultimate no-hassle dream wedding for you. Indoor, outdoor, church, lake; whatever it is you want, Belhurst has it. Not one for staying in? Belhurst is settled within a stone's throw from one of the most historically and artistically rich areas in the country. Take a day trip to the opera, theatre or multiple art museums. Or fodder your historical knowledge and discover Mark Twain or Harriet Tubman's rich past in the area. Want to see the great outdoors? Take an adventure through the rolling hills and natural wonders of New York State Parks and Wildlife refuges. But be sure to make it back for meal time. At Belhurst you don't eat dinner, you indulge in an opulent banquet fit for a king. Whatever it is you want, Belhurst's prized staff is ready and waiting to make this vacation worthy of the love you share. There are three very different places to stay in Belhurst. Chambers withing the castle main, the most luxurious and fairy tale-esque of the destinations. White Springs Manor, a Georgian mansion whose rooms will walk you straight through history. And finally, the Vinifera Inn; a more rustic cabin in the woods type of getaway. In the winter, let it snow galore! Perfect ski and snuggle weather, but bring your long underwear and be ready for a little (or a lot) of hot cocoa. During summer months toss out the fleece and bring on the sun! Not too hot, but certainly not too cold with a fairly steady temperature of 70-80 degrees Fahrenheit. Belhurst staff offers multiple day-trip options. You can choose between hiking in the woods, shopping sprees, museums, opera, theatre, historical bus tours, wine trials, skiing, golf, and so much more. Bring your wedding to a stunning location featured in Bride’s, Martha Stewart Weddings, Gourmet, Country Living and Real Simple: The Inns of Aurora. Whether inside the historic inn, recently restored to luxury, with its white columns and beautiful terraces or on the shore of sparkling Cayuga Lake, The Inns of Aurora offers you a stunning setting for your Finger Lakes Wedding. Indoors and out, you will find a wide variety of ideal spaces for your ceremony and reception. More than just a stunning location, The Inns of Aurora's staff is ready and waiting to help you create the wedding of your dreams. With everything from champagne for your toasts to the help of on-site event planners, at The Inns of Aurora you can focus on enjoying your big day. Spend some time with your family on a bicycle ride through the beautiful countryside. You can even borrow a bicycle from the Aurora Inn! In 2012, Elizabeth Mitchell of The Fashion Spot listed the Inns of Aurora as one of the top 4 romantic summer destinations for couples worlwide. Looking for a sustainable venue for your event? You don't have to skimp on luxury at La Tourelle Hotel & Spa! Whether you're dreaming of an intimate ceremony with just a few friends and family members or a large wedding celebration to share with everyone you care about, La Tourelle Hotel & Spa offers you a stunning location and environmentally conscious facilities. Spread out over 70 gorgeous acres of ponds, gardens, and gazebos, you will find many stunning locations for your reception. Indoor venues are also available. Even better, La Tourelle can add the perfect touches to make your wedding day special. Their executive chef can create delicious plated meals for your reception. Visit the on site August Moon Spa and take advantage of one of their wedding packages. All this and more awaits you at La Tourelle! La Tourelle is a New York State Certified Green Hotel! Looking for a way to relax before or after your big day? 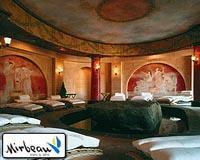 Enjoy full body Swedish massages for two at the August Moon Spa at La Tourelle. From 20 to over 200 guests, Buttonwood Grove Winery & Vineyards provides an idyllic wine country setting for your special day. Nestled in the heart of the Fingerlakes, Buttonwood Grove Winery is the region’s premier wedding destination. Offering guests the rustic elegance of a vineyard and garden, Buttonwood understands Fingerlakes destination weddings like no one else. You and your guests will enjoy both the beauty and privacy of their estate as well as memorable experiences in the surrounding wineries and vineyards. Buttonwood will tailor one of their packages to perfectly suit your occasion, style, and personality to make your wedding just as you imagined it. Let Buttonwood host some of your guests after the wedding in one of their cabins. The cabins have each been designed to offer you all the comforts of home with the convenience of staying in the midst of wine country. Experience the romance of the Finger Lakes by hosting your wedding at Buttonwood Grove Winery & Cabins. Each cabin is set in the woods, above the winery, and offers a breathtaking view of the vineyards and Cayuga Lake. Cabins have a full complement of linens – including bedding, blankets, towels, microwave, small refrigerator, coffee maker, and satellite television. A visit to Buttonwood isn’t complete without saying hello to Melody, their Scottish Highland cow! Let Bristol Harbour Lodge’s experienced Weddings Team help you create your dream day with their customizable wedding packages, beautiful outdoor ceremony sites, and indoor reception venues. Bristol Harbour can accommodate your ideal wedding, no matter if you want a grand wedding weekend or a small intimate affair. For a grand wedding weekend, they can accommodate everything from your rehearsal dinner to your farewell brunch. They provide outdoor and indoor ceremony sites and reception venues, as well as venues for cocktails, dinner, and even late-night dancing and dining. They also have a new Bridal Suite, complete with vanity seating, hanging space, a full-length mirror, and a comfortable lounge area. The wedding menus at Bristol Harbor have been crafted by their talented culinary team and showcase the best of the Finger Lakes region. Their Executive Pastry Chef can also create a decadent wedding cake for your celebration. If you’re looking for a more unique dessert, have the chef make melt-in-your-mouth macaroons, moist cupcakes, or any of your favorite treats! Book their Exclusive Wedding option if you prefer to be the only wedding held at Bristol Harbour on your special day. The package also gives you the opportunity for priority booking of accommodations for your guests staying on-site in their 31-room hotel. Bristol Harbour’s world-class service and quality cuisine, paired with the region’s timeless natural splendor, creates the perfect destination for your luxurious Finger Lakes wedding. While at Bristol Harbour, make sure to experience the Finger Lakes region, known for its 11 pristine, glacier carved lakes etched into the lush scenic hillsides. You can also check out the wineries in the area, the restaurants, the charming shops, and more. Experience one of the best restaurants in Canandaigua, New York, Tavern at the Point Restaurant. Tavern at the Point showcases the flavors of the Finger Lakes region, features an extensive beverage, and a breathtaking view of the Finger Lakes. Our No. 5 pick on this list of beautiful Finger Lakes Wedding Venues is Cobtree Vacation Rental Homes Resort. You will find Cobtree overlooking the beautiful Seneca Lake. Forget about paying an arm and a leg for a gorgeous wedding. Getting married at Cobtree is both affordable and memorable. Their outdoor venue will create a picturesque background for your ceremony. Say, "I do" with all of your family and friends there to share in your big day. After the ceremony, host your wedding reception on the lawn in a beautiful large tent. Cobtree weddings can hold up to 150 guests, and offers lodging for up to 80. Don't stress about the planning! The staff at Cobtree is more than willing to recommend the best local businesses, which can take care of the details from catering to rings and everything in between. And when you host your wedding at this lovely vacation home resort, your guests can enjoy AAA Three Diamond accommodations. Make the most of your special day! With its stunning venues, highly rated accommodations, and helpful staff, Cobtree is your best value in the Finger Lakes! The resort has 2 meetings rooms with French doors leading out onto the lawn which are especially suited for reception parties for up to 30 people per meeting room. This is a great place to host your rehearsal dinner or small reception! You and your guests can enjoy resort activities like bocce and horse-shoes, woodland walks and kayaking, or Finger Lakes winery tours! With so much to see and do in the area, Cobtree is also a wonderful place to take your honeymoon! Welcome to the ultimate family fun getaway. Complete with a water park, spa, and romantic accommodations, this is the ultimate destination wedding package. Send the kids out to have fun while you and your lover enjoy pampering yourselves to the extreme in this vacation destination you have always dreamed of. Your family determined to be near you at all times during your wedding celebration? Do you need diverse options in order to please everyone? Hope Lake Lodge is where you need to go. Let the dedicated staff take care of fun for the kids and activities to keep the extended family happy. You just focus on making the most of your celebration with the one you love. This vacation the kids will forget about bothering you as they enjoy a connected indoor and outdoor pool, a water park, and tons of staff-monitored kid-friendly events. Feel safe with the certified Hope Lake staff looking after them while you take the time to yourselves. It is time to stop worrying about everyone else. Instead try a day at the Waterfall Spa, or a peaceful walk in the luscious woods. Spend the day fishing, golfing, on a historical tour, canoeing, picnicking, or just doing nothing by the pool. It is up to you, finally you can do exactly what you want with no interruptions and no worries. Hope Lake Lodge is waiting to help you do exactly what you want, no questions and no hassle. Get a Cascades Club Membership and enjoy multiple discounts and advantages for you, your family, and those friends worthy of the luxury this resort has to offer. Hope Lake offers a large suite of conference centers for the business minded and multiple wedding packages for those who would rather sit back and watch the work get done. The Inn at Glenora Wine Cellars, located on Seneca Lake, is the perfect setting for a wedding in the heart of New York’s Finger Lakes Wine Country. The Inn at Glenora Wine Cellars has a beautiful dining room called the Champagne room that is perfect for a wedding reception of any size. The dining room has a 45-foot ceiling, a stone fireplace that stretches from floor to ceiling, and an entire glass wall that overlooks our vineyards, scenic Seneca Lake and the rolling hillside. Adjoining their dining room is a large, open covered terrace for seasonal use, also overlooking Seneca Lake, the vineyards, and the rolling hillside. The Inn at Glenora is a proud partner of The Knot and is the winner of five consecutive The Knot Best of Weddings accolades since 2014, an award that only 3% of approximately 300,000 local wedding professionals listed on TheKnot.com receive each year. James Merritt is the Wedding & Events Manager at the Inn. James’ expertise in wedding and event coordination comes from over 10 years of experience at venues and event spaces in this beautiful region. After winning their fourth Best of Wedding award at The Knot, the Inn was inducted into the prestigious The Knot Best of Weddings Hall of Fame. As the Finger Lake’s #1 Casino and Hotel, Del Lago Resort & Casino has a well-deserved reputation for excellence. A wedding is the perfect place to experience it for yourself! Del Lago Resort & Casino offers stunning ballrooms, luxurious amenities, and exceptional service that will help you plan for your special day down to the smallest detail. Their customizable space can accommodate up to 400 wedding guests, making the banquet facility and event center the perfect space for your dream come true ceremony, reception or bridal retreat. Of course, guests will have plenty of fun at the casino, spa, and various other amenities Del Lago is famous for as well! All spa packages include unlimited use of spa facilities for the day, including the herbal steam room, cedarwood sauna, spa sanctuaries, fitness center and wellness classes, and lunch at Sociale Cafe. del Lago is located in Waterloo, New York, right off I-90 at exit 41. This makes it an easy drive from anywhere in upstate and western New York, including Albany, Syracuse, Rochester, and Buffalo, as well as other large New England or Great Lakes metro areas. This is the ultimate relaxation destination. Everything from the staff to the design of the building itself is intentionally crafted to strip you of every worry you have ever had and help you focus on your romantic honeymoon of a lifetime. Let Mirbeau take care of everything for you while you focus on the only thing that really matters, your one true love. Mirbeau Inn and Spa is located in Skaneateles, one of the only remaining fairy tale towns to survive the industrial revolution. Nestled in central New York state, this tiny town is far from insignificant. The proof is in Mirbeau Inn and Spa. This old-world, French Country inspired Inn had achieved perfection in relaxation techniques. From good old-fashioned massage to newer Vinotherapy (a unique mixture of aromatherapy and hydration techniques inspired by french wine country), this spa has every thing you could ever imagine in the hands of experienced professionals. And men, this vacation isn't just to make your bride happy. In addition to couples massage and other such packages, Spa Mirbeau offers multiple treatments designed just for you. Don't be afraid of the pamper, the know professionals just how to help you relax and keep your manly status untouched. The design of Mirbeau Inn and Spa is inspired by the paintings of Claude Monet, the french impressionist artist that changed the face of art as we know it. From the books on the shelves, to the paintings of the wall, to the architecture; you will find yourselves absorbing the rich history and art without even trying. So sit back and relax. At Mirbeau Inn and Spa, relaxing is the specialty and spending quality time with the one you love is the reality. There are six French Country inspired getaways, encompassing 34 luxurious guest rooms. All with plenty of space to full appreciate your loved one. The ultimate winter getaway or the summer retreat of a lifetime. This is the perfect hideaway to retreat to with your new spouse. Mirbeau Inn and Spa has won over ten four-star and four-diamond ratings from multiple nationally recognized magazines and reviews. Calling all history buffs and long-term vacationers! Tired of the same old hotel, want a more homely vacation environment? The Skaneateles Suites & Boutique Hotel is for you. Made up of historically savvy and patriotic individual housing, this vacation getaway is exactly what you have been looking for. If you are looking for a patriotic feel, a colonial influence, or just want to vacation in an individually tailored enviroment, than Skaneateles Suites & Boutique Hotel is the place for you. The accommodations here are more like individual homes and less like a traditional hotel. This is also a desired destination for those with a more long-term vacation in mind as extended stay apartments and vacation rental homes are available. For those who tire of those peskily helpful hotel staffers, always getting in the way, then the suites are for you. Manage your own vacation and only get staff help when you ask for it. And when you do ask, a staffer will be there immediately to serve you in whatever it is you need. And he or she will be gone the moment that need is met. Or maybe you like a more bed and breakfast sort of service. Then it is the Boutique Hotel for you. A small hotel with a small, friendly, down-to-earth staff is waiting just for you. Here you will also find the perfect honeymoon suite. Complete with a ceramic Jacuzzi and kitchenette. Every morning breakfast is served right to your room so you and your lover will not miss a beat in the romantic honeymoon bliss. If you want to get out of the room, the Skaneateles Suites & Boutique Hotel is the perfect place to do some historic perusing. Learn about American history, art, and architecture in the rustic home of the New York Finger Lakes. There are four different types of resort options. The Boutique Hotel, with a bed and breakfast type service. The Bungalow Suites, where you can dictate your own vacation without the inconvenience of nosy staffers.The Extended Stay Apartments for longer vacations. And the Vacation Rental Homes for repeat visitors. Check the Secret Places Tour box during resitration and enjoy seeing all of Skaneateles' best kept secrets.